1. What is the smallest planet in the solar system? Not Pluto anymore! As of 2006, Pluto is no longer considered a planet, but is now in a small but growing class of objects called a dwarf planet. It was the smallest planet for 76 years, from 1930 until 2006. But now the planet Mercury (orbiting closest to the Sun) is the smallest planet of them all. In 2006, the members of the International Astronomical Union (IAU) voted that there are eight planets, and another class of planets called dwarf planets. The IAU currently recognizes 3 dwarf planets: Pluto, Ceres and Eris. And Titan is a satellite (moon) of the planet Saturn, not a planet in its own right. 2. Neptune is the most distant planet from the Sun. How much farther is it from the Sun than our own planet Earth? Astronomers have defined the average Earth-Sun distance to be 1 Astronomical Unit (AU). So Earth is at an average distance from the Sun of 1 AU. Isn’t that a great unit of distance? If people ask you the distance from the Earth to the Sun, you can just remember 1 (AU), and you’ll be right. You could also say that the Earth is 150 million kilometers or 93 million miles from the Sun, but those numbers are harder to remember. In these units (AU), Neptune’s average distance is about 30 AU. Since brightness falls like the distance squared, that means that the Sun is almost 1000 times fainter way out at Neptune. 3. The fuzzy “edge” of our solar system is usually defined as the spherical cloud of comets that surrounds the Sun called the Oort Cloud. How many Earth-Sun distances (AU) are there between the Sun and the outer “edge” of our solar system? There are about 50,000 AU between the Sun and the outer edge of the Oort cloud, which stretches from about 5,000 AU out to 50,000 AU or more. This cloud of objects is thought to be icy (water, ammonia and methane ices), and is the source of the long period comets that come into our inner part of the solar system. The Oort Cloud is thought to be a remnant of the protoplanetary disk that formed the solar system about 4.5 billion years ago. Most of the objects in the Oort cloud were shot out there in the early history of the solar system by gravitational interactions with the Jovian planets (Jupter, Saturn, Uranus and Neptune). 4. A pulsar is a rapidly rotating neutron star. The first known pulsar was observed in 1967 by astronomers Jocelyn Bell Burnell and Antony Hewish to have extraordinarily regular radio pulsations. Bell Burnell and Hewish referred to their discovery as LGM-1. What did LGM stand for? The source was later dubbed CP 1919, but the LGM in LGM-1 stood, in fact, for Little Green Men. The CP, by the way, was short for Cambridge Pulsar. One of the early chart recordings of the pulsar is shown below. The downward dips in the upper plot are the pulsations. National Radio Astronomy ObservatoryThe radio pulses were so regular that for a short time, one possibility considered (whether seriously or in jest) was that they were produced by extraterrestrial civilizations. In the end, the regularity of the pulsar signal was explained well within the bounds of accepted physical theories, and is now thought to be the result of charged particles accelerated toward the viewer by the powerful magnetic field associated with a collapsed star. 5. At what famous location was this photograph taken? This image was taken by the Mars Exploration Rover (MER) named Spirit as the Sun set below the rim of Gusev crater on Mars at the end of the day on May 19, 2005. As its light passes through the thin Martian atmosphere, the Sun appears in true color images from Mars as white or slightly bluish. On the Earth, Rayleigh scattering of light from gases in our much thicker atmosphere cause the Sun to redden, especially at sunset. When present, dust high in the Martian atmosphere scatters blue light forward efficiently, causing the blue halo seen here above the Sun. 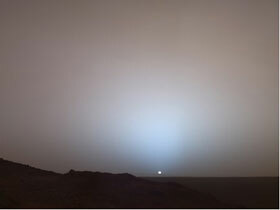 Further from the Sun, the overall red hue of the Martian sky is the result of large amounts of the same atmospheric dust. If you could measure the angular size of the sun, you would find that it was only 2/3 the size measured from the Earth. With its thin atmosphere, and larger distance from the Sun (1.5 AU), Mars is a very different place from the Earth. Don’t let the familiar look of the image fool you. Mars is a very cold, dry planet without enough atmospheric pressure to even keep you in your skin. 6. If you live in the northern hemisphere, when does the phase of the moon shown at left appear in the night sky? In general, the phase of the Moon is the result of the relative positions of the Sun, Earth and Moon. When the three bodies are lined up (Sun-Earth-Moon), the Moon is fully illuminated, and we see a full moon (position 5 in the figure below). As the moon continues its counterclockwise orbit (as seen from the North Pole), less and less of the Moon’s illuminated face can be seen from the Earth. 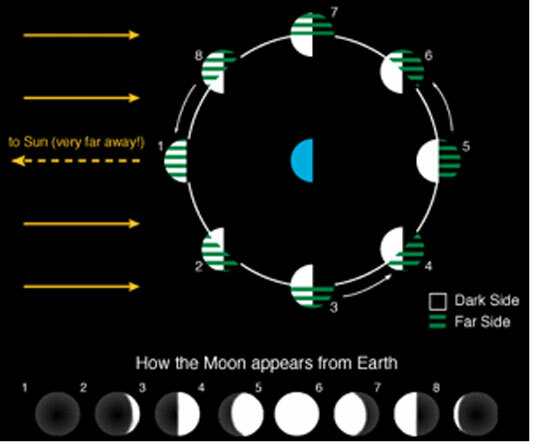 And when the Moon is almost on the same side of the Earth as the Sun (position 8), it appears from the Earth’s northern hemisphere to be a thin crescent, barely lit on the left hand side, which is the Moon’s eastern side. (If you live in the southern hemisphere, the thin crescent is on the Moon’s right-hand side.) At this point in its orbit, the waning crescent Moon rises in the eastern sky just before the Sun. Many children’s books show a waning crescent moon outside a child’s window as she goes to sleep. If this phase of the moon is outside your child’s window you may as well throw in the towel and let her get up. It’s almost sunrise! 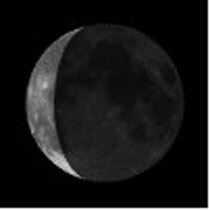 After the waning crescent comes new Moon (position 1 in the diagram), with the bodies lined up: Sun-Moon-Earth. When the Moon is “new” it rises (and sets) at the same time as the Sun. 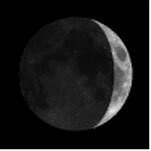 As the Moon continues its counterclockwise orbit, it starts to appear lit up on its right hand side–its Western side (position 2). At this point in its orbit, the Moon rises after the Sun, so it is no longer as obvious in the Eastern morning sky. But just as it now rises after the Sun, it also sets after the Sun. So, the waxing crescent Moon (left) appears in the sunset sky, setting soon after the Sun. That’s the moon you want to see as you tuck in your baby—children’s story illustrators take note! 7. How many times has our solar system orbited the center of the Galaxy since planet Earth was formed? In order to figure this out, you have to know a few things. First, how old is the Earth? Our best geological estimates place the Earth’s age (and thus the age of the solar system) at about 4.5 billion years. So, if we know how long it takes for the solar system to orbit around the center of the Galaxy, we can just divide these numbers and see how many times we’ve gone around. We appear to be moving around the Galactic center (which is host to a super massive black hole) about once every 250 million years. So divide those two big numbers. 4.5 billion divided by 250 million and you get 18. So we have orbited the center of the Milky Way about 20 times. Not many times when you consider that the Earth has orbited the Sun once a year for the past 4.5 billion years, or about 4.5 billion times! False. Some stars do blow up in dramatic fashion in an event called a supernova. But the Sun is not one of those stars. That only happens to “high mass stars” which are about 3-5 times the mass of the Sun or more. Stars like the sun have more a gradual death. They become first red giants (as the star swells up to the size of the inner planets’ orbits), and then shed their outer layers in a phase called a planetary nebula. (Credit: NASA)What the sun will leave behind when it “dies” is a dim, hot remnant known as a white dwarf. The outer layers that are shed can be observed, and are lovely objects, popular targets for both amateur and professional observers. 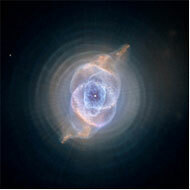 At right is a NASA image of the Cat’s Eye Nebula. 9. What are these stars? 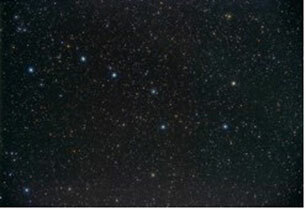 This image is of the asterism known as the Big Dipper. It is one of the best-known collections of stars in the sky, but the Big Dipper is not actually a constellation. An asterism is a recognizable collection of stars that is not a named constellation. For those of you who answered (b) The Ursa Major constellation, you were close. The Big Dipper is part of the larger constellation known as Ursa Major. Another famous asterism is a cluster of stars called the Pleiades. They are an asterism found in the constellation Taurus. The belt of Orion is an asterism of three stars located in the constellation Orion. The two stars on the far right of the “dipper” (named Merak and Dubhe from bottom to top) are the “pointer stars” that point at the star Polaris, sometimes also called the “North star” because the star is located very close to the Earth’s axis of rotation. Basically, Polaris is the star you would see if you stood at the North Pole and looked straight up! 10. Which planet in the solar system is almost the same size as the Earth? Venus is almost the same size as the Earth, with a diameter that is about 95% that of the Earth. Its density is less, giving it a mass that is only about 80% of the Earth. As a result, you would weigh slightly less on the surface of the planet. That is, you would weigh less on the surface of Venus for the instant before your were either crushed by its enormous atmospheric pressure, or incinerated by its searing surface temperature. Mercury and Mars are actually much smaller than the Earth (see above), with Mars only about half the Earth’s diameter, and Mercury less than 40% of it. The four terrestrial planets are shown to approximate scale above (left to right: Mercury, Venus, Earth and Mars). Europa, one of the satellites of the planet Jupiter, has a diameter that is about ¼ the size of the Earth. That makes Europa slightly smaller than our own moon. NASA :-National aeronautics and space adminstration.